SampleTank MAX – All the sounds you want, all the sounds you need and then some! With SampleTank MAX, you get SampleTank 3 and 22 SampleTank 3 Custom Shop Instrument Collections. SampleTank 3's universe of sounds is already pretty big. But SampleTank MAX's library is astronomically huge. Its 52GB library comes with over 4,600 instruments that incorporate the main SampleTank 3 collection as well as those in the SampleTank 3 Custom Shop Instrument Collections. You can harness your creativity and explore the music of your mind by using its 3 sophisticated sampling engines, 10 filter types, 55 high-quality effects and comprehensive 16-channel DAW-style recording tools that have made SampleTank 3 such a popular product among musicians, composers and other discerning producers across the world If you can think of a sound in your head, you can probably find it in SampleTank MAX. And if you can't, you can use advanced features to quickly and easily design the sounds of your dreams. 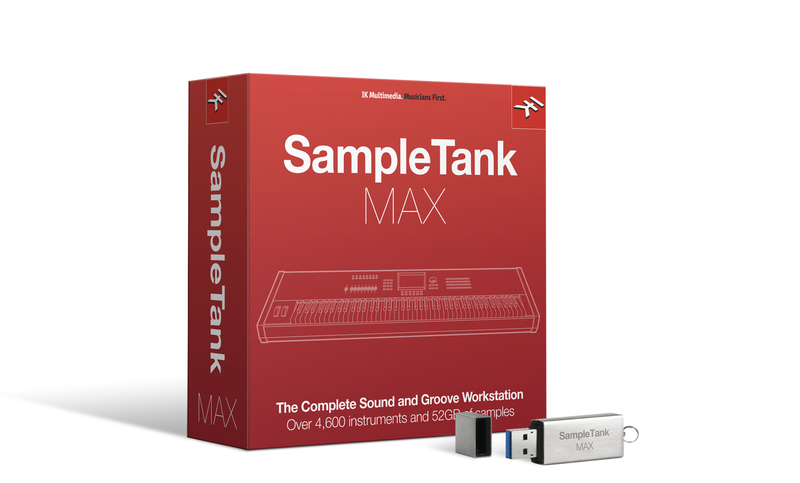 SampleTank MAX works as a standalone sound and groove workstation for your Mac/PC, and it can also be used as a 64-bit AAX, VST or Audio Units plug-in inside your DAW of choice. As a workstation, it provides you with a 16-channel multi-part interface with easy layering, an integrated MIDI player and a mixer that you can use to compose directly inside SampleTank itself. SampleTank MAX is also part of the Total Studio MAX Bundle — the complete collection of IK software MAX titles for the studio. Minimal: Intel® Pentium 4® 2.4 GHz or Intel® Core™ Duo or AMD Athlon™ 64, 2 GB of RAM (4 GB suggested), Windows® XP, Windows® Vista, Windows® 7 or Windows® 8 or Windows� 10.